Nesa i Jorda is an easily tourable contemporary circus performance to be played at schools and family venues. We aim to create curiousity for our home, the earth. In an honest, naive and playfull manner we are pondering over questions like; how many needles are there on a pine tree, how many ants is needed to lift a human being and can trees talk? We, and many people like us, are walking past trees daily. What do we really know about them? Do we even notice them? Mari Stoknes, Karoline Aamås and Love Kjellsson are wondering and telling with aerial acrobatics, fiddle play and with the spirit of adventure. In the show we are mingling spoken language with our physical expression. We use the mix between words and movements in space as a way to connect and communicate with children, who can easily relate to a world where the small things in life can lead to exciting adventures. The music is inspired by traditional Scandinavian music and is played acoustic on violin and singing. It is simple rather than complex. Non-intrusive but welcoming. The show is played in norwegian, mixing the two beautiful dialects of Sunnmøre and Oslo, but can be played in english or swedish if wanted. 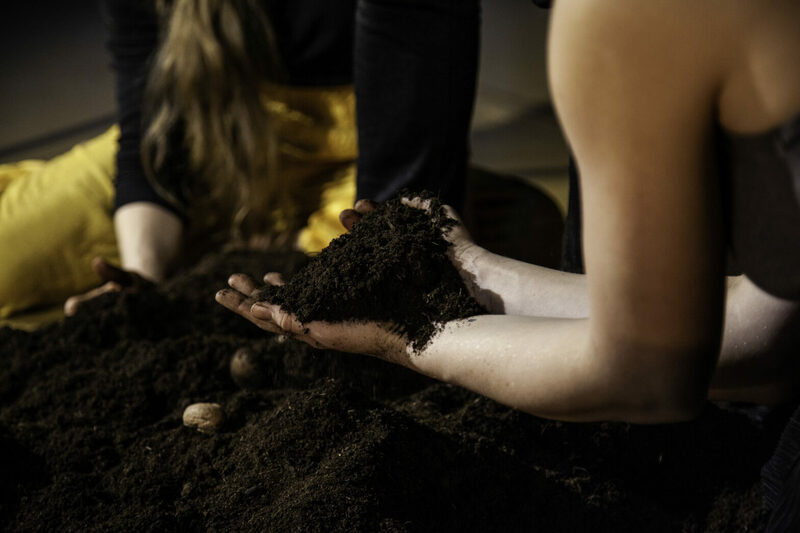 ”Nesa i jorda” / (”With the nose in the soil”(norwegian saying)) will be a show for children and families, the production is premiering in january 2020. With support from RED and Cirkus Xanti. Space: Any room. Stage: 6x6x6 meters. We use aerial but can bring our own rig. Contact us for details.